This page contains a lot of data displayed in several charts and tables. It is best viewed on a laptop or desktop display. The x05 model numbers indicate professional connectivity. That is the only difference. The x00 and x05 models are otherwise identical in all other respects. The x05 models include an SDI (Serial Digital Interface) jack, and sometimes they also include jacks for GenLock and, depending on the model, TimeCode as well. The 3G-SDI jacks on all XF x05 models provide uncompressed raw High-Definition video output with TimeCode and embedded audio at a rate of 1.485 gigabits per second (the XF705 has 12G-SDI). The x05 models are intended for use in professional news gathering and television production environments where pro connectivity is key. The x05 models also include HDMI output just like the x00 models. An easy way to remember the difference between the two is that the x00 models have HDMI only, while the x05 models have HDMI plus SDI (and sometimes GenLock and TimeCode). 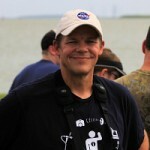 Sensor resolution is given in effective pixels (not total pixels). In the lens row, the equivalent 35mm focal length range in millimeters is stated in parenthesis, followed by the filter thread diameter. The focal length range is approximate due space constraints in the chart. For example, the range for the XF100 / XF105 is stated as (30-304) when it’s actually 30.4-304mm. I.AF in the focus row stands for Instant Auto-Focus, and the linked brochures for each camcorder go into more detail about the various focusing technologies. The video row gives only the maximum resolution and frame rate for that model; all of these camcorders offer a variety of resolution and frame rate options. The same is true for the format row. The number before the format, such as 50 MXF, indicates the maximum bit rate in megabits per second. In the included and optional battery rows, the figures in parenthesis to the right of the battery model numbers are the approximate endurance in hours and minutes for typical recording with the LCD screen open. 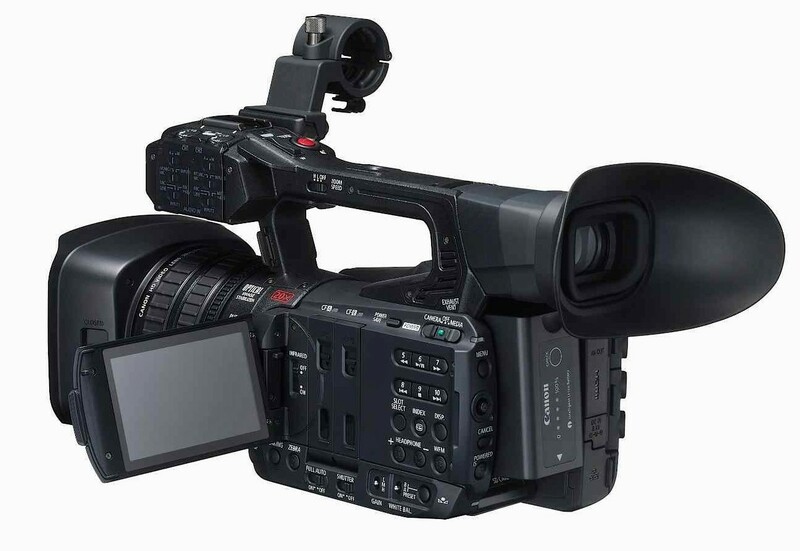 The various camcorder user manuals, linked below, will provide more specific details regarding battery endurance in recording and playback modes under various conditions. In the row for the power adapter and battery charger model numbers, a “+” indicates both items are provided whereas a “,” indicates a separately available item. For example, CA-930 + DC-930 refers to the combination of the power / charger unit and the camera connection cable that goes with it. Meanwhile CA-946, CG-800 refers to the included power adapter and the separately available battery charger. Be advised that the indicated prices shown on this page are at or near the full MSRP (the manufacturer’s suggested retail price) and may not reflect current discounts and promotions offered by dealers. In most cases — that is, for all models except those most recently announced — the actual amount charged by a dealer will most likely be well below the prices given here. * 160 XF-AVC to be added via future firmware update. All Canon XF series camcorders include selectable Neutral Density filters, vectorscope, waveform monitor, focus assist, 2-channel 16-bit 48 kHz audio recording, two XLR audio input jacks, HDMI output, headphone jack, USB Mini-B, LANC remote jack, built-in stereo microphone and a removable external mic clamp. All include two primary flash card slots for dual recording or relay recording purposes. The compact XF100 and XF105 are the smallest and lightest of the XF series, and also have the shortest zoom range. They record Full HD at 50 Mbps in the MXF file format to two Compact Flash cards. An SD card slot is used for moving image profile settings between cameras. These camcorders have one control ring on the lens barrel which can be assigned to either zoom, focus or iris. There are ten assignable buttons and a customizable control dial. The XF105 adds two jacks, for 3G-SDI and GenLock. The XF200/205 may well represent “the best of both worlds” by combining some popular features of its big brother, the XF300/305, into a medium-sized body. It is a single-CMOS camcorder like the XF100/105 but it has three control rings on the lens barrel for zoom, focus and iris. The 20x lens is the longest focal length in the XF line and stops down to only f/2.8 at its maximum zoom, which is equivalent to nearly 600mm in 35mm terms. The XF200/205 records Full HD at 50 Mbps in the MXF file format to two Compact Flash cards, and an SD card slot is provided for a third simultaneous MP4 recording. There are thirteen assignable buttons, LAN, WiFi with IP streaming capability, and a rotating hand grip. 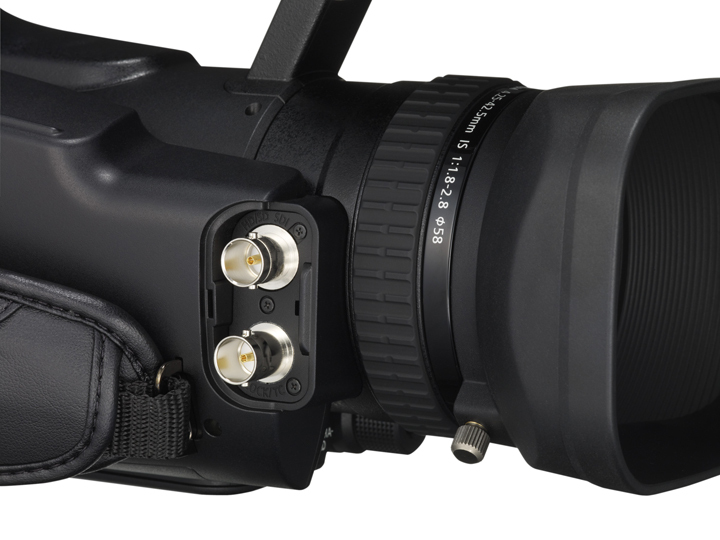 The XF205 adds four jacks, for 3G-SDI, GenLock, TimeCode and composite analog video output. The large XF300 and XF305 are the biggest and heaviest of the XF series. The ample body size allows for a three-chip CMOS image sensor array and a larger diameter lens than the other models, providing the fastest maximum aperture of the XF line, at f/1.6, stopping down to only f/2.8 at full telephoto. The XF300/305 records Full HD at 50 Mbps in the MXF file format to two Compact Flash cards. An SD card slot is used for moving image profile settings between cameras. The center-mounted LCD monitor has a unique dual-swing design that allows it to be positioned on either side of the body. These camcorders have three control ring on the lens barrel for zoom, focus and iris. There are thirteen assignable buttons. There is an analog component HD/SD video output. The XF305 adds four jacks, for 3G-SDI, GenLock, TimeCode and composite analog video output. Equipped with a large one-inch CMOS sensor, the XF400 and XF405 are the first XF series camcorders to offer 4K UHD recording capability. Roughly the size of the XF100/105, these camcorders actually bear greater physical similarity to Canon’s XA series product line, with a removable top handle that allows for a very slim and compact camera configuration. 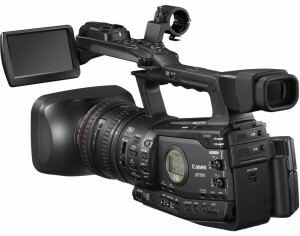 The XF400/405 borrows a substantial amount of technology directly from the Canon Cinema EOS C200 (such as its ND filter turret design, image processors, 4K MP4 recording format, Dual Pixel AutoFocus, Wide DR Gamma and other features), and is in fact well-positioned as a companion camcorder to that particular cinema camera. These camcorders have one control ring on the lens barrel which can be assigned to either zoom, focus or iris. There are five assignable buttons plus an assignable touch-screen area. They are equipped with LAN, WiFi with IP streaming capability, and Bluetooth. The XF405 adds a 3G-SDI jack. 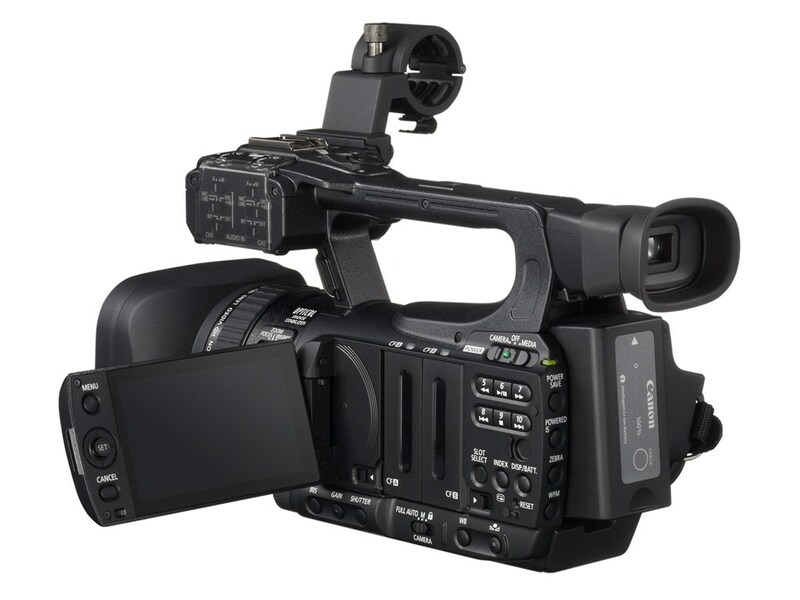 As Canon’s new flagship of the XF professional camcorder line, the XF705 is substantially larger and heavier than the XF400/405 with the same lens, dual processors and image sensor. 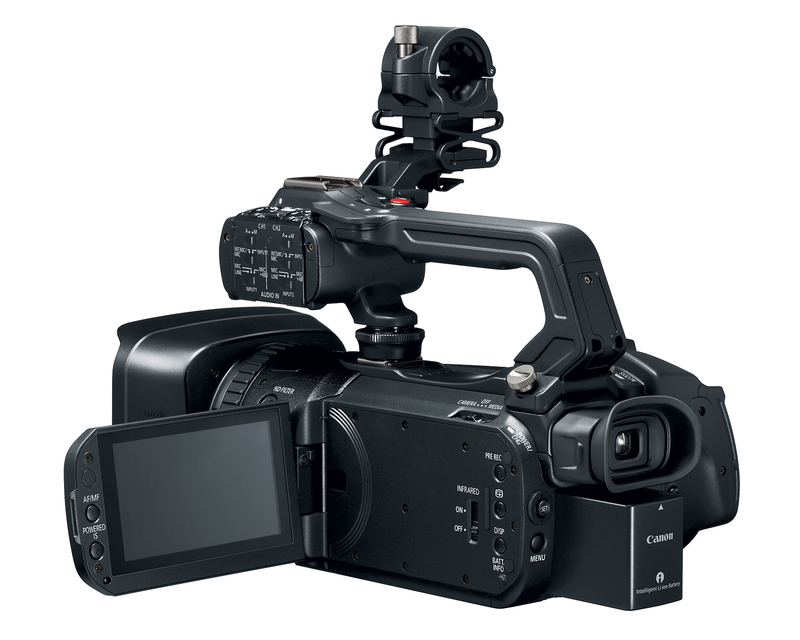 However, it uses the larger battery series from the Cinema EOS C200 and offers three separate lens control rings for focus, zoom and iris plus TimeCode, GenLock, and 12-G SDI for moving 4K video over a single cable. The main feature that sets the XF705 apart from the XF400/405 is its 10-bit 4:2:2 H.265 XF-HEVC recording codec, which handles 4K 60p video at 160 megabits per second (or Full HD 120p video at 180 Mbps). A future firmware update will add 8-bit 4:2:0 XF-AVC recording at 160 Mbps a variety of smaller bit rates). HDR video recording is possible via HLG (Hybrid Log Gamma) mode for live broadcast or PG (Perceptual Quantization) for color grading and mastering. Dual Pixel AF with touch-focus and face detection, Wide DR Gamma, dual recording and relay recording are a few of the many features carried forward from the XF400/405. A large articulating four-inch LCD touch screen opens to the left or right side of the camera. The XF705 is also equipped with LAN and WiFi with FTP and live streaming capability. Please note that there is no corresponding non-SDI model XF700; there is only the SDI-equipped XF705. “Canon Camera Museum Camera Hall: HD Camcorders” by Canon Inc.
“Professional Camcorders Product Pages Index” by Canon USA. 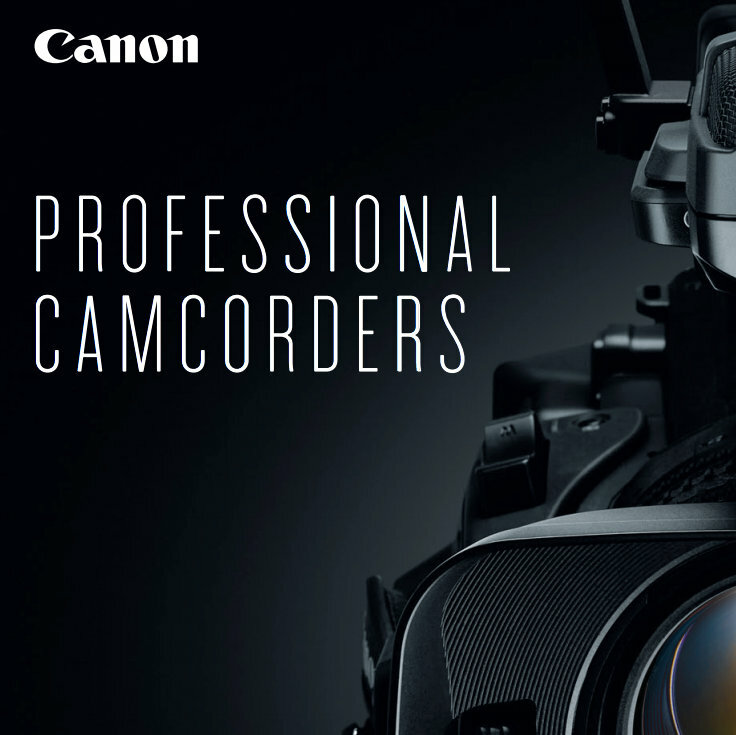 “2018 Professional Camcorders Catalog” by Canon USA. 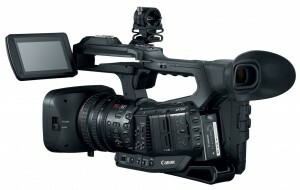 “Canon XF Series Camcorders,” a DV Info Net discussion forum.